So As I Promised, Here Is A Merlin Fiction To Get Over My Feels For The End Of The Show. Here is the first chapter. I'm Happy with it!!! Finally!! Summery: Merlin comes back with his King and Gwaine, but this life must come with a price. Merlin knows this all he has asked is for is time. Time so that he can make sure Arthur is safe. But as the time draws to a close Merlin must say goodbye to Arthur and Arthur must let him go. ‘She guessed,’ Gaius said finally joining the party who were welcoming the survivors. Percival checked Gwaine over thoroughly. “Your okay? I thought Morgana had….” He trailed off remembering the sound of his friend’s screams. “Merlin you’re going to have to tell me everything that happened, but first bed.” Merlin looked at his mentor and relief and gratitude filed his eyes. Arthur saw this and understood immediately. Merlin sat there on his horse letting the fact that he had safely returned Arthur and Gwaine back home. He couldn’t seem to muster the energy to swing his legs off the horse and join the others. He knew he should be putting the horses away, but Arthur had already given them to another servant who was patiently waiting for Merlin’s mare. Arthur wanted changes and he knew what they were. Arthur had accepted magic, and more importantly accepted him for who he really was Emyrus, the greatest Warlock in Albion. He was happy, ecstatic even, his destiny was fulfilled he hadn’t failed Arthur. However the weight of the sacrifice given to bring back the lives of his two best friends from the brink of death had exhausted him, and the shadow of the ice cold voice still lingered in Merlin’s head. He felt a tug on his hand as Gwaine tried to get his attention, the rest of the knights were staring at him as well, “Huh?” he asked stupidly. Merlin finally pulled himself together and leapt off the horse. He steadied himself on Gwaine’s resurging arm, which was wrapped securely around his waist. He gave his friend a thankful smile and started forward with the rest. That’s when it happened, his vision tunneled and a blood rushed to his ears, his knees gave out and he crumpled to the floor. Arthur had been watching Merlin carefully, ever since he had pored more magic from himself, reviving Gwaine. It had been beautiful and mysterious, but Merlin had been tired and Arthur had seen his best friend become paler as they had rode back to the citadel. However his worries had fled as his arms were wrapped around his wife and Merlin’s mentor had come on to the scene, there was nothing Gaius couldn’t fix. Merlin would become his advisor and be rewarded for the loyalty and friendship he had given Arthur over the last ten years. As he watched Merlin swing of his horse and into Gwaine’s awaiting arms he turned and followed his wife until he heard the unmistakable sounds of someone collapsing. He was instantly at Merlin’s side calling his name as the colour drained from Gwaine’s face. They locked eyes over Merlin’s still form and Arthur saw that he had just come to the same conclusion he had. Merlin heard the whispers from far away. “Something is wrong.” He instantly recognised the tight worry in the man’s voice it was Gwaine. 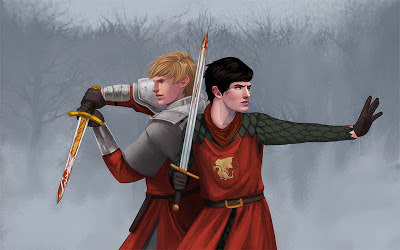 “Arthur, Merlin barely said a word when we rode back to Camelot. Are you sure there wasn’t a price to pay for bring people back from the edge of death? I believe you heard the voice just like I did.” Gwaine said angrily. Arthur strongly believed that peace had descended. He had quickly met with the round table, not wanting to leave Merlin’s side for too long, incase he woke to find his friend not next to him. Merlin hadn’t woken for nearly three days and worry was starting to seep into Arthur. He could feel it emanating from Gwaine as they watched their friend sleep, breathing evenly under the mountain of blankets Gwen had provided for him. Gaius said that he was just tired, and needed rest, however the question that kept ringing in his head was what the cold voice had meant. It had whispered and he had heard as he floating in the darkness. I give them life, but all given life must come with a price. And the price must be paid young warlock. Arthur had come back to consciousness with a start to find Merlin sobbing. He had soothed his best friend and that’s when Arthur had seen Gwaine’s still form in the clearing with them. Merlin had used magic to heal him, but he was so pale as he staggered to his horse to ride back to Camelot. Arthur and Gwaine had felt fine, great in fact, the soreness had vanished and he felt refreshed and alive. They had kept riding; Arthur wanted to see his kingdom and more importantly his wife. He hadn’t noticed his best friend exhausted body struggling to stay on the saddle. He sighed feeling once again like the selfish prince who had first met Merlin all those years ago. Then Merlin stirred and Arthur was thrown back to the presence as Gwaine bounded to the edge of the bed with Arthur close at his heels. Merlin opened his eyes. His vision was blurry and his body felt heavy. The first thing that he realised was that the room was not his own. It was far too grand and the four-poster bed he lay in was beautiful. The second thing he saw were his best friends peering down at him, worry etched on their faces. “Are you okay?” He crocked barley able to get past the dryness in his throat; he coughed and gasped in pain. Arthur was instantly at his side soothing him. “What’s wrong?” he asked agitated. Merlin hid the pain well; he had learnt how to since the moment he had become Arthur’s protector. So he smiled and asked for water. He knew what he was doing when he had given his life to his King and his best friend. He had asked for time, time to make sure that there were no more threats to Arthur, that he and his queen were truly safe. But with this time came pain, the sacrifice would not be quick, but drawn out. Merlin knew he was willing to give anything just for sometime with his King, but Arthur couldn’t know, couldn’t be told until the last moment. The truth would crush him, and no one hurt his King, especially not Merlin, he was the savior and the comforter, not the other way around and Merlin would make sure of that. So as the glass of water was pressed to his lips and he looked into his King’s eyes and saw the worry still rooted there, he swore to himself that he would take that away no matter what the price was.